Characteristics: Nylon Coated Stainless Steel. Perfect for glass, stone, and metal beads. Great wire for beading and fast shipping. Thank-you! 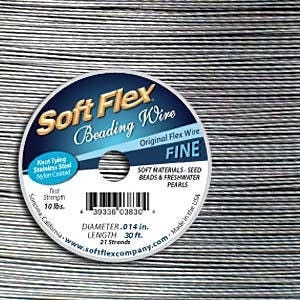 I'm looking forward to using this Soft Flex wire for the heavier glass beads I'm starting to use. I usually use Fireline + small beads under 6mm. Y.T. is a great shop to do business with, with quick ship and careful packaging:) T.Y.